DEMERS, MODESTE, Roman Catholic priest and missionary, bishop of Vancouver Island; b. 11 Oct. 1809 at Saint-Nicholas-de-Lévis, L.C., son of Michel Demers, farmer, and Rosalie Foucher; d. 28 July 1871 at Victoria, B.C. 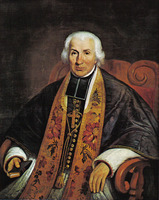 Modeste Demers was educated at the seminary of Quebec and ordained priest in 1836 by Bishop Joseph Signay*. 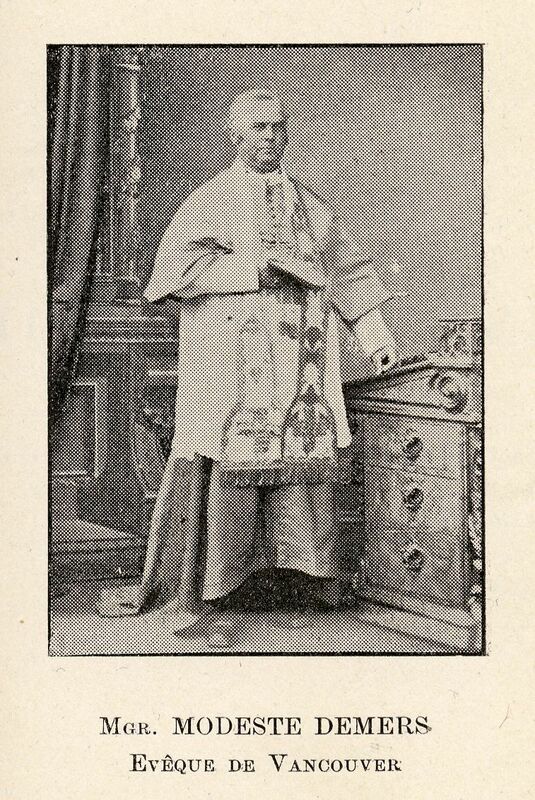 After serving briefly as priest at Trois-Pistoles, Demers was accepted by Signay in 1837 as a missionary and sent to work under Bishop Joseph-Norbert Provencher* at the Red River Settlement. The following year he was selected by Signay to accompany the Reverend François-Norbert Blanchet in answer to the calls of the Roman Catholics of Oregon for their own missionaries and priests. Demers and Blanchet found much work to occupy them among the settlers and the French Canadian servants of the Hudson’s Bay Company in the Oregon country posts. But Signay had indicated that their primary duty was to be to the Indians and had instructed them to learn the native languages as quickly as possible. Demers’ facility with languages had already attracted attention at Red River, and after 12 months on the Pacific coast he had compiled a dictionary, a catechism, a prayer book, and hymns in the Chinook jargon and had acquired an elementary knowledge of more than one of the Indian languages of the area. His good knowledge of English was also useful, particularly in dealing with the HBC which held the economic and political power in the Oregon country and whose patronage was essential to any missionary who hoped to travel beyond the confines of their main post, Fort Vancouver. Demers’ work in the Oregon country was characterized by arduous and extensive travel, large scale baptisms, and elementary religious instruction of the Indians, often using Blanchet’s Catholic ladder, a graphic representation of the historic progress of Catholic Christianity. He was particularly active in the establishment of a mission at Cowlitz and later made two notable missionary journeys to the north. He was the first Christian missionary to reach the mainland of the present British Columbia. In September 1841 he visited Fort Langley in the Fraser Valley and made contact with and baptized many of the Indians assembled there. The following year, Demers extended his mission to the Carrier Indians of New Caledonia, travelling with the HBC caravan to Fort Alexandria. Here he wintered, built a small chapel, and made several expeditions to Fort George, to Stuart Lake, and to the Atnan people. Returning to the Oregon country, Demers, after 1844, served as pastor in Oregon City under Bishop Norbert Blanchet. 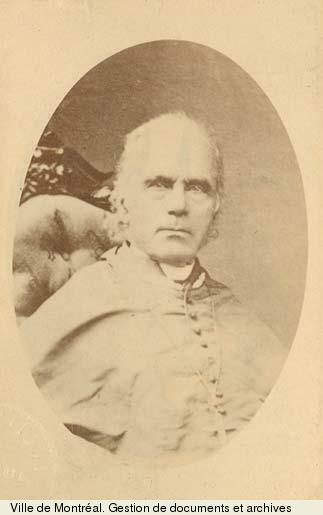 With the elevation of Oregon to an ecclesiastical province in 1846, Blanchet became the first metropolitan, and his fellow missionary from Quebec, Modeste Demers, who had retained his interest in and concern for the northern Indians, was appointed bishop of Vancouver Island and administrator of the diocese of the Princess Charlotte Islands (Queen Charlotte Islands) and New Caledonia, being consecrated as such on 30 Nov. 1847. The new bishop of Vancouver Island was reluctant to accept his burden, feeling that Blanchet had been too hasty in recommending the establishment of a bishopric in a region with apparently such sparse resources and so little touched by Christianity. Vancouver Island itself had been visited briefly by Spanish priests in the late 18th century and in 1843 by Father Jean-Baptiste-Zacharie Bolduc, who had accompanied James Douglas to the site of Fort Victoria as the HBC began its withdrawal from the Columbia. On the mainland of British Columbia only Demers himself, Father Pierre-Jean De Smet sj, and Father John Nobili* sj had visited the Indians. Outside the fur-trading posts of the HBC virtually no white settlement existed. Before taking up residence in his new diocese, Demers directed his energies towards acquiring funds and mission personnel to help cope with the vast task that lay before him. Travelling extensively in Europe, particularly in France, Demers managed to find several missionaries for his diocese, but was sadly disappointed with the response to his appeal for funds. 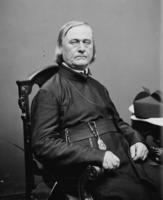 Arriving at his episcopal seat in 1852, Demers confessed that “now I am the village priest, I sing mass on Sundays and feast-days, and also preach from time to time [and] as for resources, you know that I do not hold them in my hand.” The slender means of his diocese, his dependence upon unpredictable sources of financial aid from Quebec and Europe, and his at times desperate need for competent English-speaking priests were problems which were to remain with Demers until his death. During the Fraser River gold rush of 1858, greater attention was focused on the distant Pacific colonies and Demers was able to persuade the relatively new order of the Sisters of St Ann of Montreal, led by Sœur Marie du Sacré-Cœur [Salomée Valois*], to commit themselves to work in his diocese, and to convince the missionary order of the Oblates of Mary Immaculate to establish their headquarters at Esquimalt under the Reverend Father Louis d’Herbomez*. A girls’ school, orphanage, and later a hospital were established for the population of Victoria under the aegis of the sisters. The Oblates established a school for boys in Victoria and continued Demers’ own work of missions to the Indians both on Vancouver Island and on the Fraser River. 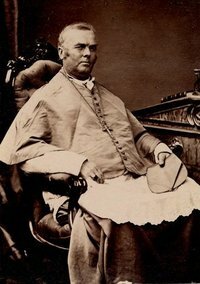 The bishop himself was thus able to begin construction of his cathedral in Victoria, to give more attention to the organization and supply of his diocese, to extend his charitable works, and to visit the miners and others in the distant parts of his diocese. 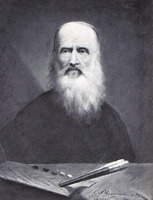 The departure of the Oblates for the mainland in 1865, with the appointment of d’Herbomez as vicar apostolic of British Columbia, was a serious loss to Demers’ work, in spite of the fact that relations between the bishop and the order had never been smooth. Since 1863, however, Demers had been applying to the American College at Louvain, Belgium, for English-speaking priests, and it was fortunate that this institution was now able to fill the void left by the withdrawal of the Oblates. Demers himself was becoming increasingly sickly, and in 1865 retired temporarily to San Francisco for medical care. The following year he again left Victoria for a three-year extended tour of South America, the eastern United States, Quebec, and France, soliciting men and money for his diocese. 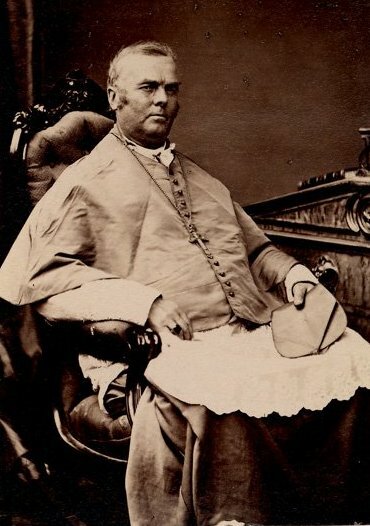 He came back to Victoria briefly in 1869, only to return to Europe with Father Charles John Seghers* to attend the œcumenical council at the Vatican in 1870. In France en route to Rome the bishop was badly injured in a train accident, from which he never fully recovered. He died a year later at his residence in Victoria, only a few days after British Columbia entered the Canadian confederation. The days of the fur trade empire and of the crown colony had ended, and the character of the Pacific province was soon to be radically changed. It was perhaps fitting that during his last illness Bishop Demers “frequently expressed a desire to see and converse with Sir James Douglas, who was often found at his bedside.” It was Douglas who had first greeted the young Demers at Fort Vancouver, and whose role in the fur trade and as a colonial governor had brought him into continuous contact with the bishop for over 30 years. It was their world of trading posts and Indians, of civilization in the wilderness, of company government, and of the close contacts of a small colonial society which had now passed. AAQ, Colombie anglaise, I–III (letters from Modeste Demers to the archbishopric). Archives de la Congrégation pour l’évangélisation des peuples (Vatican City), Lettere e Decreti; Udienze di Nostro Signore; Lettere della S. Congregazione e Biglietti di Monsignore Segretario, Scritture riferite nelle Congregazioni, America Centrale. Archives de la Propagation de la Foi de Paris (France), F.202 (Vancouver, reports of the missions, 1847–1922). Archives de l’archevêché de Rimouski, Lettres de Mgr Modeste Demers à l’abbé Edmond Langevin, 1848–1866. Archives Deschâtelets (Scholasticat Saint-Joseph, Ottawa), Dossier Orégon, I, A–XI, 1–3 (Modeste Demers to Father Pascal Ricard, o.m.i., Superior, St Joseph Mission, Olympia, W.T., 1853–56); B–IX, 2 (Miscellaneous correspondence of Modeste Demers with Father Louis d’Herbomez, o.m.i., 1860–65). Archives générales o.m.i. (Rome), Dossier Modeste Demers (microfilm at the Archives Deschâtelets, Scholasticat Saint-Joseph, Ottawa). Archives of the Archdiocese of Portland (Portland, Ore.), Letters of Modeste Demers to Mgr N. Blanchet. PABC, Modeste Demers correspondence, 1860–71. Modeste Demers, J.M.J. Chinook dictionary, catechism, prayers and hymns. Composed in 1838 & 1839 by Rt. Rev. Modeste Demers. Revised, corrected and completed, in 1867 by most Rev. F. N. Blanchet. With modifications and additions by Rev. 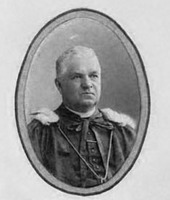 L. N. St. Onge . . . (Montreal, 1871). P. M. Hanley, “The Catholic ladder and missionary activity in the Pacific northwest,” unpublished ma thesis, University of Ottawa, 1965; “Frs. Blanchet and Demers and missionary preaching in Oregon,” unpublished phd thesis, Pontifical Georgian University, Rome, 1965. Morice, History of northern interior of B.C. M. L. Nichols, The mantle of Elias; the story of Fathers Blanchet and Demers in early Oregon (Portland, Ore., 1941). A. E. Oksness, “Reverend Modeste Demers, missionary in the northwest,” unpublished ma thesis, University of Washington, Seattle, 1934. 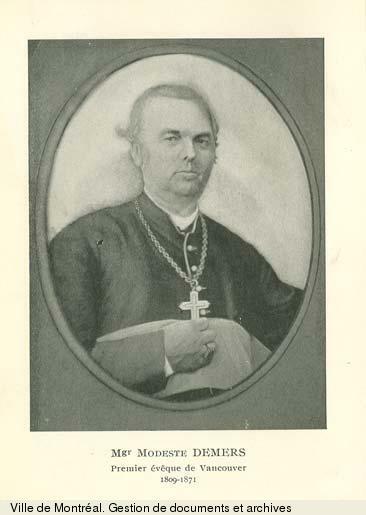 J. M. Hill, “The most Reverend Modeste Demers, D.D., first bishop of Vancouver Island,” CCHA Report, 1953, 29–35. Émilien Lamirande, “L’implantation de l’Église catholique en Colombie-Britannique, 1838–1848,” Revue de l’université d’Ottawa, XXVIII (1958), 213–25, 323–63, 453–89. Jean Usher, “DEMERS, MODESTE,” in Dictionary of Canadian Biography, vol. 10, University of Toronto/Université Laval, 2003–, accessed April 26, 2019, http://www.biographi.ca/en/bio/demers_modeste_10E.html.